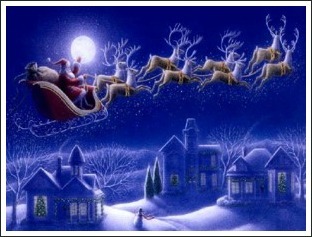 The Night Before Christmas Poem: A Visit From St Nicholas. The Night Before Christmas poem was first published anonymously in 1823 in a New York newspaper under the title 'A Visit From St Nicholas'. Although no-one is completely certain who wrote A Visit from St Nicholas, a man called Clement Clarke Moore, a university professor who lived in New York City, is generally believed to be the author. The poem was immediately popular and has been republished many times over the years in various formats. These days you can choose from a number of different book versions, illustrated by different artists. They're all gorgeous but this one is my favourite. Many families make reading The Night Before Christmas poem together on Christmas Eve one of their family Christmas traditions.